Ridgeline Road in Joplin, Missouri is a typical commercial highway, five or six lanes wide and lined from one end to the other with every big-box store, cheap motel and fast-food joint in the south-eastern United States. I was there to pick up a new puppy, whom my son Cole had named Hobbes from his picture on the web. Hobbes came from a dog-breeding operation called Diamond Doodles. Around 9:00 A.M. I pulled into the vast parking lot of the Joplin Sam's Club to meet the newest member of my family. A year or so earlier I had been standing in a different parking lot, this one filled dozens of kids returning from summer camp and the parents there to pick them up. A lot of dogs had come along to welcome their campers back home too and one of them caught not just my eye but my heartstrings as well. He was a happy fluff-ball I later learned was a Labradoodle. That dog started a long series of conversations. After a lifetime of never having a pet of any kind, I thought it was time to consider a dog. 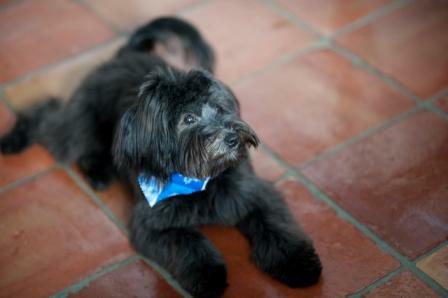 My wife, Tracy, liked the idea of a dog and loved the idea of a poodle mix that would not shed. My two youngest sons, Gray and Cole were dying from excitement and enthusiasm. My oldest, Fletcher, thought a dog would be okay. A friend said, "You should think about a Soft-Coated Wheaten Terrier," and that suggestion eventually led me to (that pinnacle of the canine world) the Whoodle, a Wheaten and Poodle mix. Most of the breeders I could find did not have any dogs available. A lot of them had waiting lists, which I thought was a drawback at the time. In fact, if I were looking now that would be the first thing I'd want to see. But at the time, I wanted a dog who could join us by Gray's 12th birthday. Diamond Doodles seemed like a great choice. Their web site told me they are "family -run." That sounded good. They had a lot of testimonials from happy dog-owners. I talked to their vet who vouched for the general health of their dogs. And of course, there were the pictures. You don't have to be an artist to make a puppy look cute and Daisy was about the cutest thing I'd ever seen on four legs. I wanted that dog, so didn't ask as many questions as I should have and I heard the answers I wanted. In fact, Daisy turned out to be pretty much perfect. She's a little shy which I now think is probably due to lack of early socialization, but she's strong and healthy and she's really the perfect dog for me. I couldn't love her any more. So, when we started talking about a companion for Daisy, it was natural to look at the Diamond Doodles web site again. We trolled through the pictures for a few months before it felt like the time was right. 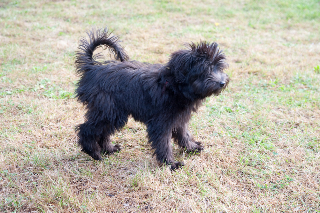 In July we saw a dog that seemed right for us, another Whoodle, male this time, black like Daisy, except with a ruff of white fur on his chest and three white socks. By this time, though, I was starting to have some concerns about Diamond Doodles. Maybe it was just the number of dogs they produce or the vague information about the parents - both of which I now know are warning signs. Anyway, I asked our trainer, Marilyn, if she'd look at the Diamond Doodles site and give me her opinion. That was on a Thursday. Marilyn was going to get back to me on Friday, but later the same day Tracy and the boys and I were all gathered around the computer looking at Hobbes picture - he already had a name by that point - and I bought the dog. Everyone was so excited and he already kind of felt like a member of the family. This is the moment in this whole story of which I am the most ashamed. I let my kids’ enthusiasm and my own, sway my judgment. I already realized I had some concerns about Diamond Doodles, but I didn't even wait to learn what questions I should be asking before I bought a second dog from them. Marilyn was very thorough. She really looked closely at the site and she gave me a disturbingly long list of questions to ask. As soon as I saw the list of questions I reached a new level of appreciation for how ignorant I am about dogs and breeders. They all seemed so obvious once they were pointed out to me. How many dogs are there? How much are they handled as puppies and by whom? Why were certain pairs bred? The real turning point came when I talked to Colleen at Diamond Doodles about picking up Hobbes. Her response was, "We don't have anyone come to the house." Even I knew that's standard operating procedure for a puppy mill. What kind of person is ashamed of their own home? And what were they afraid of me seeing? So that's how I ended up in the parking lot of the Joplin, Missouri Sam's Club on a hot July morning. Hobbes was dirty, skinny and very wary of everything, including me. All I wanted to do was take my dog and get out of there. We stopped a lot on the way home. Hobbes had a lot of food and water and a few little treats as well. In Kansas City he had his first taste of real meat, a tiny portion pinched from the edge of a Winstead's hamburger. After a big romp in a park in KC he started to think I was maybe okay. By Des Moines he was following in my footsteps and chasing my shoelaces. Now Hobbes is a happy and well-adjusted member of our family. He's healthy and gaining weight quickly. After three baths there is still a whiff of the horrible kennel smell he had when I picked him up but he's starting to just smell like a healthy pup. He's a little loose in the hips, but it's too soon to tell if that will be a problem and he runs and walks just fine so I'm not too worried about it either way. Is Diamond Doodles a puppy mill? I don't know. Is it some kind of canine hell where the dogs are abused? Probably not. They're licensed and inspected by the State of Missouri and according to everyone I spoke to they are in compliance with all the laws. But the more important question is really, "Are the dogs there treated according the same standards that I have for my own pets?" And the answer is, "No." I am writing this partly as penance for my own bad judgment, partly to help raise the consciousness of other people who want to make an ethical choice in their selection of a pet. I think a rescue or pound dog is probably the most ethical choice. But there is nothing wrong with going to a good breeder. I love Hobbes and Daisy and it is hard for me to imagine my life not just without a dog, but without these exact animals. So I'm not sure I can say that I regret buying them from Diamond Doodles. But I will say that if I knew what I know now when I bought Hobbes and Daisy, I would have found a different breeder. I'm ashamed that I was impulsive and made a couple of important decisions based on cute pictures instead of facts. Here’s at least part of what I've learned: Don't buy a dog on the internet. Don't buy from anyone who isn't proud to have you visit their operation. Ask a lot of questions - a good breeder will expect it and encourages you to be a knowledgeable buyer. And when, like me, you don't even know what to ask, find someone who can give you some help!